Football bet slips with 100% success at ComboBets.com! 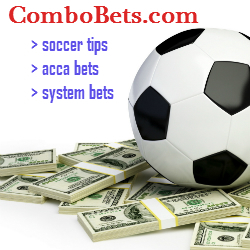 We – ComboBets.com – start the new 2016 year with 100% success of our bet slips, including two winning accumulators @ 5.60 (+28.00 pts) and one winning system bet @ 9.09 (+9.09 pts)! SAT ACCA @ 3.32 WON (+16.60 pts)! 1. Watford v Man City: BTTS @ 1.66 WON! 2. Man United v Swansea: 1 @ 1.55 WON! 3. Arsenal v Newcastle: 1 @ 1.28 WON! SUN ACCA @ 2.28 WON (+11.40 pts)! 1. Palace v Chelsea: 2 DNB @ 1.45 WON! 2. Everton v Tottenham: BTTS @ 1.57 WON! 2. Crystal Palace v Chelsea: 2 @ 2.10 WON! 4. Valencia v Real Madrid: X @ 4.33 WON! * See our record in Decemer 2015 here.